Check out a list of all the cheat codes in Red Dead Redemption 2 and learn about the newspapers and unlock requirements needed to use them. Rockstar Games has at last released Red Dead Redemption 2 for PlayStation 4 and Xbox One, giving players another chance to drop into the studio's signature take on Western-style open-world action. As might be expected, the latest Rockstar title is chock-full of various goodies and bonuses, including the option to use a variety of different cheat codes with varying and often hilarious effects. Unlike many other games, however, cheats codes in Red Dead Redemption 2 come with their own specific unlock requirements. Cheat codes in Red Dead Redemption 2 are entered through the Cheats menu, which players can find by pressing Triangle (PS4) or Y (Xbox One) within the Settings menu. Once there, they'll be able to browse through a list of all the game's many cheat codes. However, many if not most of them will be locked, and must be unlocked by fulfilling certain requirements, generally by tracking down specific newspapers from cities spread across the in-game map. 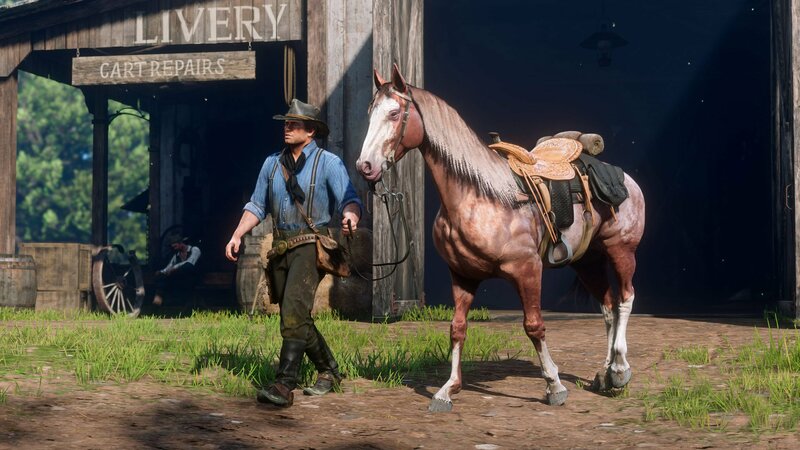 Cheats in Red Dead Redemption 2 can spawn new items, horses, or even reveal the entire map. We've listed all of the cheat codes we've discovered below, and provided information about how and when they can be unlocked. As with other Rockstar Games releases, players should be aware that using any cheat codes will disable Trophies and Achievements. You long for sight and see nothing Fog of War Reveals all of the world map Purchase Blackwater Ledger No. 66 or New Hanover Gazette No. 31 following the mission Blood Feuds, Ancient and Modern (Chapter 3). 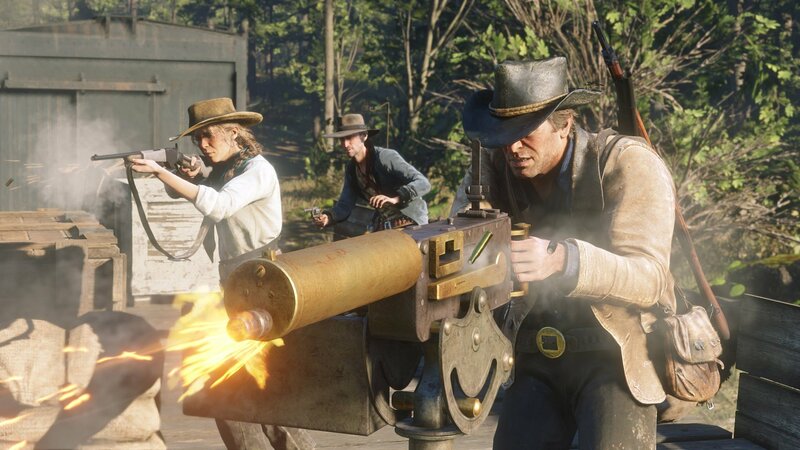 You seek more than the world offers Fortify Health, Stamina, and Dead Eye Bars Restores and fortifies health, stamina, and Dead Eye Purchase New Hanover Gazette No. 36 following the mission The King's Son (Chapter 6). Greed is American Virtue Heavy Weapons Gives the hero the Mauser Pistol, Semi-Automatic Pistol, Pump Action Shotgun, and Bolt-Action Rifle Purchase Saint Denis Times No. 46 or Blackwater Ledger No. 65. following the mission Advertising, the New American Art (Chapter 3). Virtue unearned is not virtue Increase Honor Increases Honor to the maximum level Purchase Blackwater Ledger No. 67 following the mission Banking, the Old American Art (Chapter 4). The lucky be strong evermore Increase Stamina Grants infinite stamina for the hero and the hero's horse Purchase Blackwater Ledger No. 68 following the mission Dear Uncle Tacitus (Chapter 5). Abundance is the dullest desire Infinite Ammo Infinite ammunition for all weapons Purchase New Hanover Gazette No. 237 or Blackwater Ledger No. 62. Would you be happier as a clown? Spawn a Circus Wagon Spawns a Circus Wagon Purchase Blackwater Ledger No. 73 following the Epilogue Part 2. You are a beast built for war Spawn a War Horse Spawns a War Horse Purchase Blackwater Ledger No. 72 following the Epilogue Part 1. This list of Red Dead Redemption 2 cheat codes and unlock requirements is still a work-in-progress, and we'll be updating it through the coming days, weeks, and months as we discover even more cheats. Be sure to stay on top of all the biggest hints and tips in Rockstar Games' latest release by heading over to Shacknews' Red Dead Redemption 2 walkthrough and guide.